Changing of seasons also can mean changing up your beauty and skincare products as your skin may have different needs. I was trying to think of my go to must have products for fall. If i had to pack a survival kit of sorts, which five products would I put in there to get through the change in seasons? Read on to find out more about which ones I picked and why! You'll never spot a makeup remover in a cuter bottle than this! Not only does it have a unique floral design on frosted glass, but this makeup remover is unlike any other, infused with Organic Cornflower Floral Water. This has a calming effect on the eyes and is safe for those that have sensitive skin. Treat your sensitive eye area right with fresh scented makeup remover. If you're like me and you're eyes are going through traumatic times with fall allergies, you're going to want something gentle and refreshing to use around your eye area. Bonus, the pump top makes product control an ease! This famous bright pink sponge known as the Beauty Blender is going to be one of your must have tools in your fall survival kit. The pointed elliptical shape makes application of concealer and foundation around the tricky eye area a breeze. To use this, I put foundation on the top of my hand and dip a wet sponge (it expands to twice it's size when wet) into the product and then basically tap and roll it on my face for even flawless coverage. No other sponge can quite fit the contours of your face like the Beauty Blender. You especially need this if you've seen that infamous dreaded line around your chin, bottom of your face or hair line. Your skin may be lightening up since summer has passed and you may have to make some adjustments to get those last uses out of your summer foundation. The Beauty Blender will help you do just that! Don't be scared to mix your lighter foundation with a darker one to create your own personalized perfect shade as well! The name says it all with this, it is truly divine. I've said it before and I'm sure I'll say it again, L'Occitane is one of my favorite fragrance, skincare and hair care brands hands down. This product is definitely no exception. Why does this product work? Because divine serum boasts the highest concentration of Immortelle and Myrtle essential oils for visibly younger-looking skin. If you're sensitive to scents like I am, this is a great brand for you to check out. I've only been sensitive to one perfume out of the numerous products I've tested by L'Occitane. This serum has the lightweight silky feel I've come to love in my obsession with serums. This has a noticeable scent but it's so fresh, uplifting and rejuvenating. Before bed after my face is washed I will apply the serum, eye cream and face cream and I seriously feel so pampered and amazing. This is the must have splurge gift for yourself or as a gift to a loved one. I highly recommend this in conjunction with the Divine Cream. Stay tuned for my full reviews of the Divine product line. If you're a coffee lover like me, you're going to love this set. And what woman isn't a fan of coffee AND pampering? This product combines the two in an adorable gift set. With the upcoming holidays, give that coffee lover something different. I'm sure you can think of someone or many someones who would just love this! The kit includes 1 Coffee Body Polish, 1 Coffee Lotion Bar & 1 Coffee Bean lip balm and is handmade fresh weekly with organic, natural earth-derived and kid-friendly ingredients. It seriously doesn't get much better than that. The body polish does have a coarser texture to it as it contains larger grains. I liked the texture, but if you have real sensitive skin it may be a bit harsh for you. It really does smell like coffee and lemon and it's such an amazing scent. After using the body polish which I usually used on my hands, I used their skin cream (focusing on cuticles) and then the lotion bar. The lotion bar has the cutest design with actual coffee beans inside. This is a definite must in your fall survival kit as your hands and body will start having to weather colder weather. I first tested this brand in my monthly Ipsy bag and fell in love with the texture and scent. I'm also a big fan of using natural products. The ingredients in the vanilla lip balm pictured above are Coconut Oil, Beeswax, Organic Extra Virgin Olive Oil, Natural Flavor, Organic Stevia. Those are definitely the kinds of ingredients (possibly except for natural flavor) that you're going to want to see in a moisturizing and hydrating product. Your lips are going to need this for sure in your survival kit as the days turn colder. 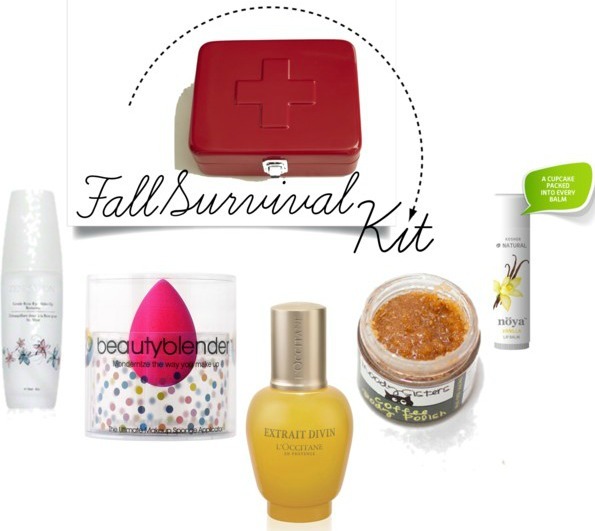 What is your essential products will you have in your fall survival kit? Comment and let me know! And don't forget to follow me on Instagram, where I post photos of the latest and greatest first.